“Songkran” translated does not mean “New Year,” but refers to the first month of the traditional Thai calendar, which means “movement or change.” In Thailand, Songkran festivals are actually celebrated in the middle of April, which, in that country is also the hottest time of the year. Songkran festivals in Thailand are traditionally celebrated with the splashing of water, to signify cleansing or renewal, and also to cool those who are standing outside in the hot sun. Here, we had a mild 70-degree, mostly sunny day in Los Angeles, so any sort of splashing was probably kept to a minimum. But it didn’t stop tens of thousands of people from converging on Hollywood Blvd for the day. In 2009, the festival attracted around 100,000 people. Sunday’s crowd didn’t seem that large, but it was somewhat larger than last year’s Easter Sunday Songkran attendance of 50,000 (which also had an earthquake as a bonus). The Songkran Festival is a rare treat. Though centered on a particular culture, it seems to be one of the rare events that attract immigrant Thais, Thai-American young adults, Latino families, Armenian senior citizens and white hipsters alike to the boulevard. And perhaps because there’s something for everybody: Music and dance stages, a beauty pageant, a children’s activity area, clothing, arts and crafts for sale, fruit carving demonstrations, a Muay Thai kickboxing tournament, tourism information and of course, Thai food. The event was close enough for me to walk to — parking is generally hard to find and most people are smart enough now to take the Metro Red Line into the festival at the Hollywood/Western station. EHNC Vice President Eric Moore reaches out. 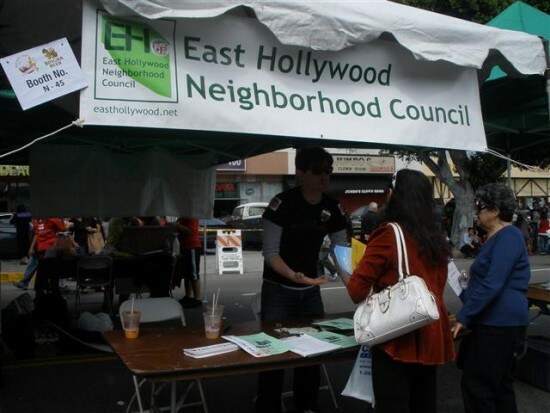 I also volunteered at the East Hollywood Neighborhood Council outreach booth, near Hollywood and Winona. EHNC Governing Board members Armen Makasjian, Shahan Suzmeyan, Eric Moore, Jennifer Robinson and IT Committee member George Pelham also pitched in to help, giving away our “I Love East Hollywood” bumper stickers and meeting info fliers – the latter of which all ran out, thanks to Eric’s enthusiasm. The EHNC also contributed $1000 towards the festival, directly sponsoring the children’s arts and crafts pavilion. 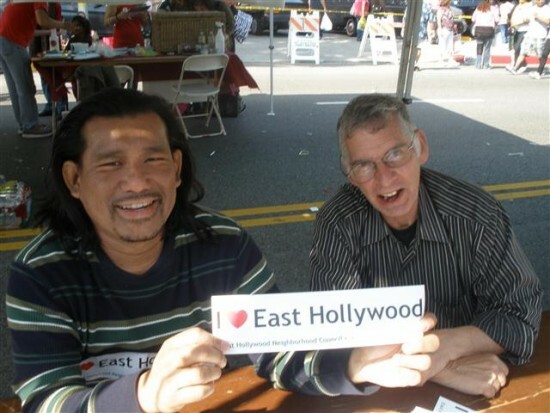 Me (left) and EHNC IT Committee member George Pelham show some love for the 'hood at the EHNC booth. Songkran is a great event that I look forward to every year. It is, after all, the largest festival in East Hollywood, and one of the largest in Los Angeles (probably only eclipsed by Fiesta Broadway). Suksan wan Songkran!